Since many centuries, medical practitioners have always been mapping limbs, various organs, and emotions specific to certain points. 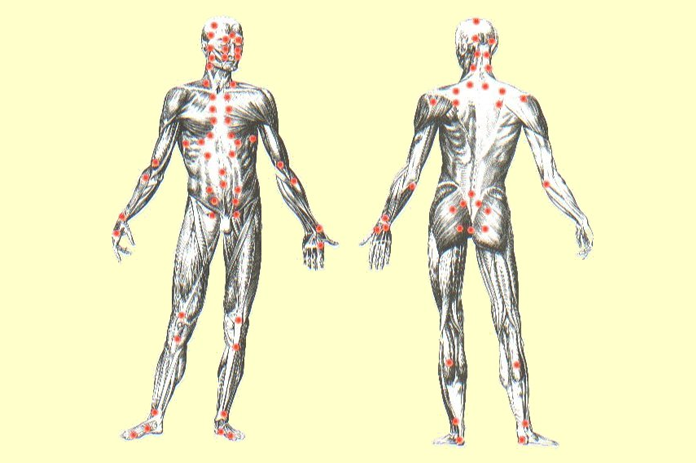 In Chinese medicine, these points are nothing but Acupressure or Acupuncture points. But, in Ayurveda, these are known as Marma points. According to both the realms of medicine, the energy is assumed to settle down at the points. This aspect can certainly help to heal the person once the energy is released in the most suitable way. Basically, the focus lies on manipulating the prana or subtle energy. But, with a broader perspective, they are also effective when the person is seeking to enhance blood circulation and relieving himself from stiff muscles. It’s found that there are 107 marma points in the body. Every point serves a purpose when someone presses it with his finger. But, if the person is thinking about a remedy, then the therapist uses oil for rubbing the area gently. If you are thinking which type of oil is used, then it totally depends on the dosha and the constitution of the body. Most of the time, marma points are measured in ‘finger units’ or anguli. For instance, Hridaya, the marma point around the heart measures four anguli in size. The expert massages the area with Sesame oil so that blood circulation is considerably enhanced. In case you can go for a rejuvenating session, then you can place your palm and induce the effect. Marma points always lead to a drastic transformation within the body. Since they have the potential to bring about the change, pressing them gently can help to cure a disease. In fact, they can alleviate the severity of the disorder even if the person is emotionally weak. Once the marma points are properly stimulated, it can always offer results as you had thought about. The energy block is released once the person goes through a marma therapy. He can attain peace which was perturbed due to bad habits, unnecessary thoughts and many more reasons. Once the marma therapy ends, the person can decide whether he wants someone to give him an Abhyanga massage. 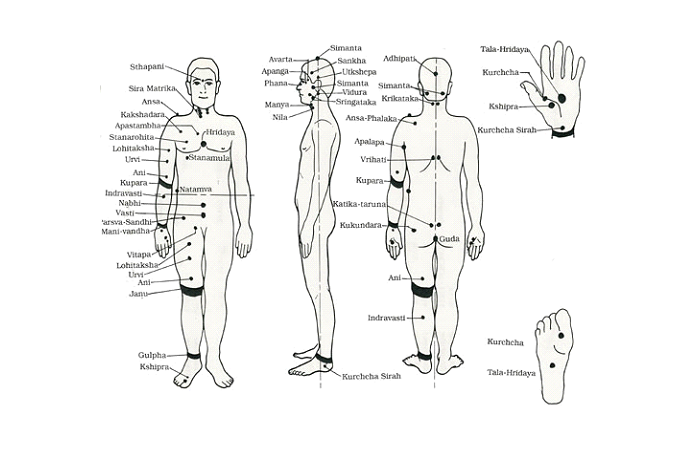 Here is the image that depicts the marma points across the entire body. You can check out the location of every point on the palm and through the front, back and side view. Before starting off, you need to sit upright without bending your spine. You can sit in front of the mirror to check out the posture and the position of the hands. #Step 1 – Once you calm down, you must start from the third eye just above the nose bridge. While you exhale, you should press the area gently and count till seven. You then need reduce the pressure, count 5, and inhale. Repeat this 7-5-7-5-7-5 approach for three times in one go. #Step 2 – After some time, you need to perceive a point above the eye. AS you place the ring finger on the eyebrow point, you should keep the index finger on the hairline point and middle finger between them. Once you have positioned the fingers, you need to move with the 7-5-7-5-7-5 approach once again. #Step 3 – Now, with the help of the thumb, you need to gently press the edge of the eyebrow sockets. At this instance, you should slowly move upwards till the skin of the forehead shrinks. You need to be careful because the thumb shouldn’t slip from the position. #Step 4 – Moving ahead, you need to press the cheekbones that are located below the center of the eyes. To do this step, it’s always better to use your index finger. #Step 5 – Once you have located the marma point, you need to press the area inwards and in the upward direction. #Step 6 – Now, you need to use the third finger for pressing the outer edge of the nostril. At the same time, you should never forget to press your cheekbones once again. #Step 7 – A little later, you should bring all your fingers closer and press the region between the upper lip and the nose. You should also press the region below the lower lip as you follow the same procedure. #Step 8 – Afterwards, the center of your chin should be pressed with the same 7-5-7-5-7-5 procedure. #Step 9 – Finally, you can pull certain sections of your hair and massage your head gently. Start combing your hair backwards through straight and lengthy strokes. Marma points can certainly help to clear the mind, body and soul. While the person gains instant relief from a cluttered mind, he can think about being emotionally strong. As the energy is released from the point, the massage aids in improving blood circulation. The person would also be able to connect with the mental and physical aspects of the body. Marma massage is beneficial for people suffering from joint pain. So, if your joints are paining for a long time due to arthritis, then you can get relief through the massage. Finally, since the marma therapy is considered as a self-healing process, you can always balance the doshas and stay healthy. Shoulder pain – you must apply pressure to the Kshipra marma and Kurpara marma. For Abdominal pain – pressure needs to be applied to the Kurpara marma and Urvi marma. Chest pain – pressure needs to be applied to Kurpara, Urvi and Ani marma. Neck pain – it’s essential to apply pressure to the Ani, Kurpara and Kshipara marma. Knee and leg pain – apply gentle pressure to the Gulpha and Kshpira marma. Sciatic pain – it’s necessary to apply pressure to Gulpha and Kshpira marma. To improve metabolism – rub the Kurcha marma gently. To improve the flow of prana – pressure should be applied to the Kurcha marma. For effective digestion – apply gentle pressure to the Kurchashira marma. Improve the functions of the reproductive system – apply pressure to the Kurchashira marma. Reduce visceral fat – pressure needs to be applied to the Manibandha marma. Improve the function of the heart – apply pressure to the Kshipra marma. Improve the function of the heart and lungs – pressure should be applied to the Talahridaya marma. Promoting visual acuity – rub the Kurcha marma gently. In order to add strength to the muscles – press the Kurchashira marma gently. To get healthy joints and alleviating skeletal pain – pressure needs to be applied to the Manibandha marma. For stimulating the lymphatic system – apply pressure to the Kshipra marma. To receive energy for healing – pressure should be applied to the Talahridaya marma. To boost the immune system – apply pressure to the Talahridaya marma. Hope you have learnt about marma points and the massage you can always opt for. Spread the words over social media and make it even louder for better awareness.